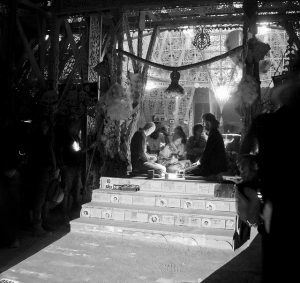 Of the many rituals that happen at Burning Man, the one that sparked my curiosity most was the one that I came to participate in myself. It all began when I was looking at the photos that appeared after the Burn in 2011. The longtime Burner photographer Scott London had published his selected images from that year, and while they were all wonderfully lovely, one picture made me go, “What is that? Who is that? I wish I could have participated in that.” If you’re a Burner, you know this feeling. 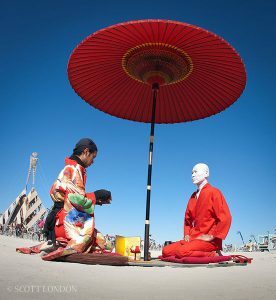 “That” was an image of two kneeling individuals facing each other under a beautiful large red parasol. One man was in a colorful kimono holding a bowl in both his hands, and the other man was wearing simple red clothing, as if he were a Buddhist monk or an ascetic. His shaved head and face were painted white, and he gazed upon the man with the bowl with a silent, poised face. It made me think of a Japanese green tea ceremony (otherwise known as the way of tea) which has existed since the 12th century. As an anthropologist, such ceremonies have always fascinated me. Something was special about this moment between the two participants, with the Man Base and heavy machinery in the background. While there was no guarantee I would ever see this man in red under the large parasol on the playa, I did secretly hope I could participate in whatever this experience was. 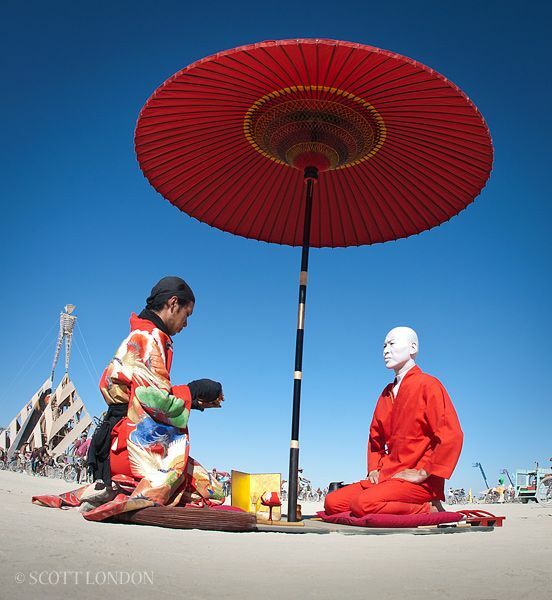 The next year in Black Rock City, I found myself chatting with a Burner from Japan. 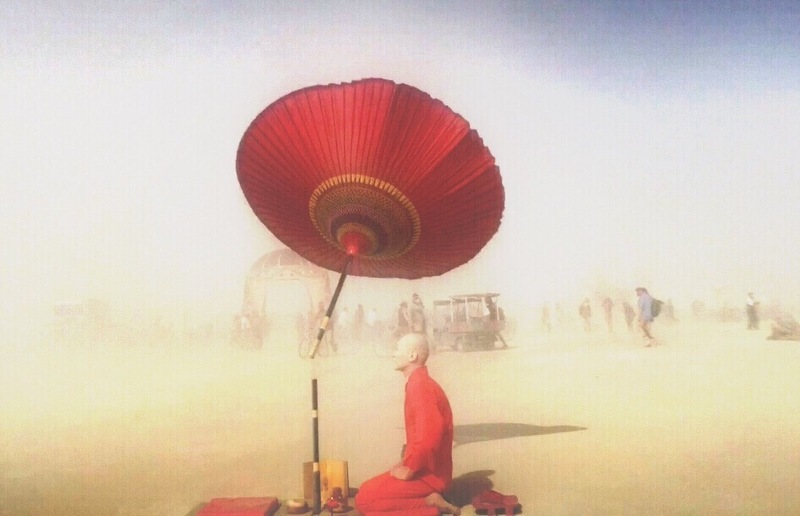 As we chilled on a pink furry couch looking out on the playa eating some coconut chocolate chip ice cream, I described the image to him and asked if he had knew about this man in red who seemed to be performing this ceremony. After all, the man in red did seem to be of Japanese descent, and I figured there could only be so many Japanese Burners on playa. And it turned out that, yes! He did know who that was, and he told me excitingly that he was volunteering with him, and it was happening tomorrow night at the Temple. 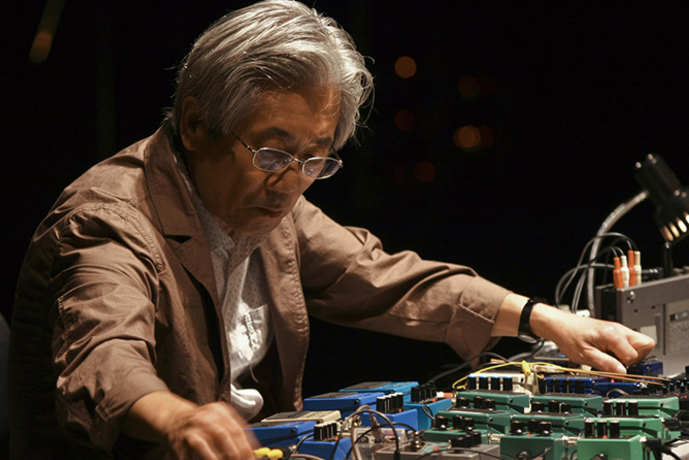 He handed me a sticker that said “Red Tea Ceremony” with Hechi-Ken Hamazaki, Thursday, 3 pm at the Man, Friday, 9 pm at the Temple. As my new smiling Japanese friend Takashi got on his bike and disappeared into a whiteout, I got immediately excited knowing I would be able to participate in the ceremony. The following evening, I got going to the Temple of Juno. It wasn’t super dusty or particularly cold as I walked into the Temple grounds. A small group of Japanese Burners in kimonos and haoris were congregating and setting up. The Temple that year seemed to echo aspects of Japanese and Asian architecture, and it seemed fitting for such a ritual to take place there. As the evening grew darker, the arrangement for the ceremony was placed on top of some steps that lead into the heart of the Temple with a thick rope hanging across, and a small light shining a beam below to the elements. A line of participants began to form close by, and Ken, dressed in the same red garments and white makeup, walked up to the tatami mat, removed his wood geta slippers, and knelt onto the red pillow gracefully. I didn’t know it then, but he would not remove himself from the kneeling position the hours he was engaged in the ceremony. I got in the line and began to watch as the first person was motioned by a volunteer in Japanese Edo period garments to come up the steps. The participant slowly walked up and knelt on the red pillow opposite of Ken. The eyes of both participants met, and they slightly bowed to one another. The ceremony began. Ken initiated by placing a small red box on a red plate in front of the participant. He extended his hand as if to signal “partake in this gift.” As the box was opened, there seemed to be a treat of sorts that could be eaten while the preparations began to take shape. As the participant began to eat this treat silently and slowly, Ken moved in elegant form, as if he was preparing this tea for an emperor or a queen. It was as if time had stopped. People who were walking in and around the Temple froze in place and became transfixed. This was something special, and whoever this man in red was, he obviously had perfected this movement with what could have been a lifetime of practice. Indeed, in Japanese culture, there are movements and arts that do require such discipline and study. The preparation finished, a gold vessel that resembled a Tibetan singing bowl was offered with the liquid spirit. The participant took the bowl slowly and rose it to their lips. After a few deep slow sips, the bowl was carefully placed back. Ken took a wooden object, tapped the golden vessel slightly, and a gong rang out like the sounds that I’ve heard echo from the monasteries deep in the Himalayas. Another slight bow was exchanged, and then Ken took the opened red box he had earlier given the participant and like a magician folded it to become a white origami that had a special print on it to commemorate the ceremony. 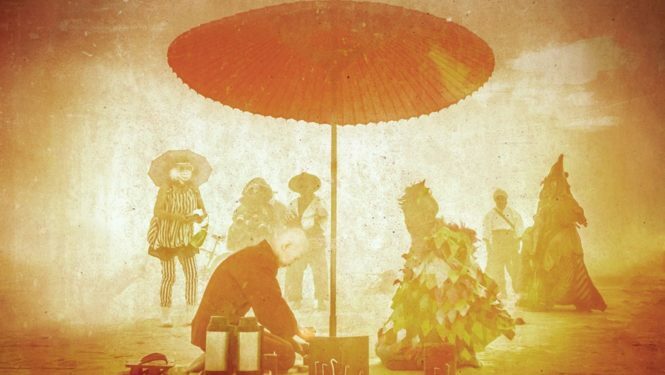 I partook that night in my first Red Tea Ceremony at Burning Man. And I have continued to every year since. I still find out where it will be the same way: On those pink furry couches meeting Takashi for coconut chocolate chip ice cream. In a way, that became its own ritual too. Participating in the ceremony, I have felt humbled and mesmerized. It felt like I was playing a part in the continuation of a wonderful story and the transmission of a unique human tradition. It was like we were living art, and all the viewers were looking at a lovely painting in motion. The sounds of the energetic playa slowly faded. I was aware, open, and reflective — not just of my own self and presence, but of all the cultural traditions and rituals that have existed across human history — traditions that have faded and been forgotten, those that are still barely existent, and those with us in our daily lives. In a world that always seems to get faster and more crowded, experiences like the Red Tea Ceremony bring me back to the simpler ways we used to live and connect with each other. It is something that makes us essentially human, and I hope such rituals will continue to be part of our societies, however that looks. As the program coordinator for Burners Without Borders, Shawn helps facilitate socially innovative projects through BWB’s initiatives, grants and chapter network. Before joining the Burning Man staff, Shawn lived around the world for a number of years working and volunteering for community development nonprofits including building his own school for youth who live in the train stations of Calcutta, India. 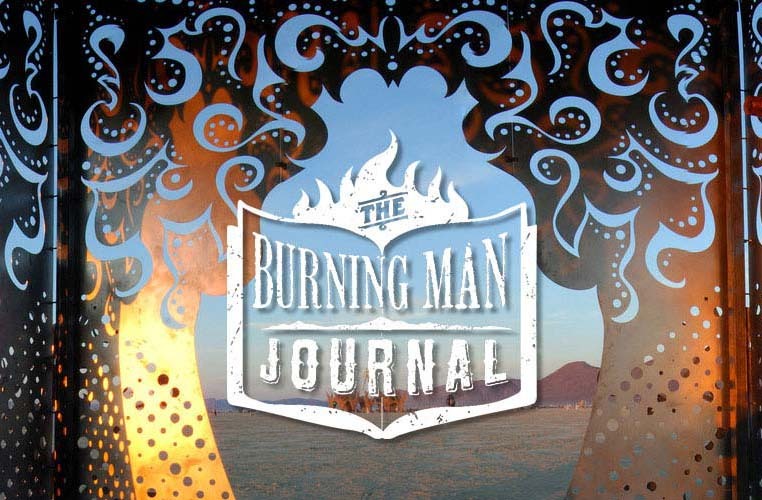 Burning since 2011, he’s helped bring art to the playa every year and was on the first Ma’Patz (DPW) crew for Midburn. From the SF Bay with a BA in cultural anthropology, he’s excited to help facilitate and extend Burning Man culture globally.